Since everyone hated the first ship, what about this one? 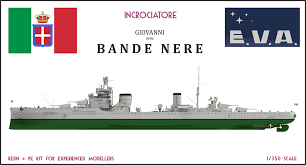 The game has Duca degli Abruzzi which is an evolution of the ship class you mentioned (both being from subclasses of the condottieri class), so I don't think there would be much point having this ship in game. Eventually WG will add a RM cruiser line, until then we just have to be patient. Even though we are not able to promise that everything will be actually reflected, we're always open to hear any opinions regarding the ships @PolishLithuania , thank you! The game has D﻿uca﻿ degli Abruzzi﻿﻿﻿﻿ which is an evolution of the ship class you mentioned (both being from subclasses of the condottieri class), so I don't think there would be much point having this ship in game. Eventually WG will add a RM cruiser line, until then we just have to be patient. Location: Its Kuching Bro Malaysia Penisular Sarawak. I rather request a Bolzano or a Capitani Romani or or Zara. If everyone can get their requested granted, can I ask for the old Minekaze to make a come back? PS, I don't think everyone hated the first ship at all. It's just that these threads have a life of their own, and can go anywhere.